The picture shown is the same design of 'bracket' you will get with a Maniflow Lcb. From my experience they are well worth fitting as they steady the complete manifold and it helps to prevent engine movement from fracturing the large Y shaped manifold for cylinders 1 & 4. 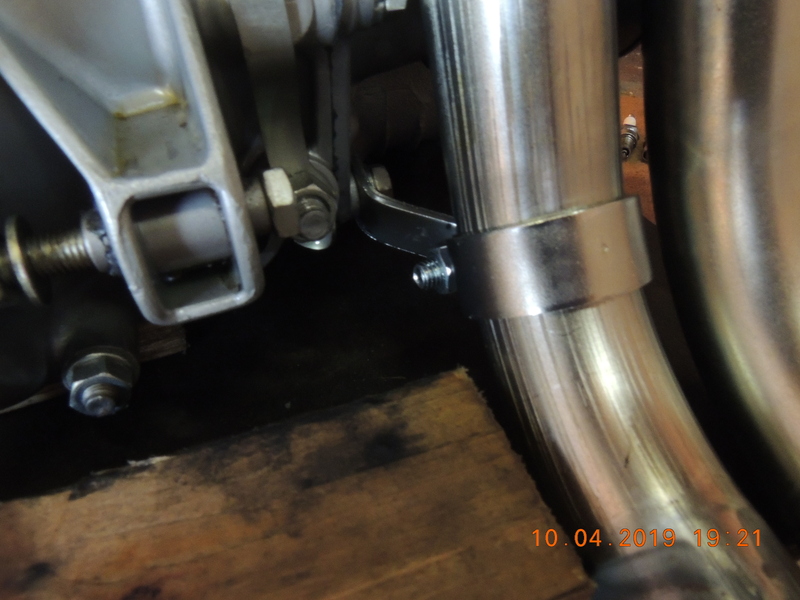 However, in the picture, the bracket should have been fitted on the other side of the manifold downpipe so that it is more in line with the diff cover. It can also be shaped to achieve this by bending into more of a Z shape to. On my race engine I do not use the original diff output cover bolt as a fixing because in the course of a season they are removed frequently which could result in thread failure in the gear case. I have fitted a stud into the gearbox and this works fine. 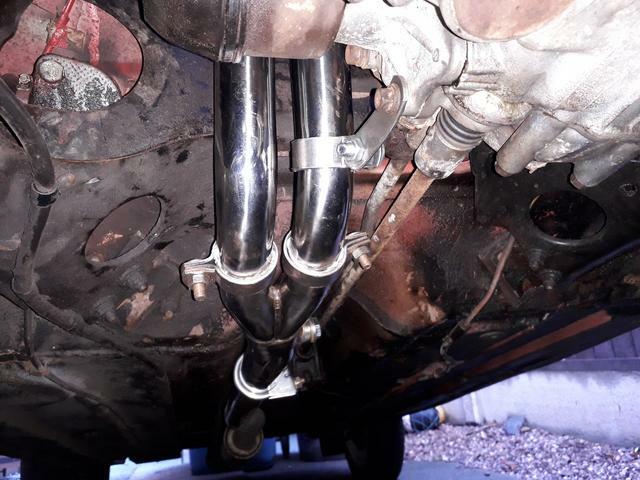 Whilst it doesn't look particularly well engineered, in practice it works well, it is easy to remove and install and as far as I am concerned is an essential part of the exhaust system. How have people bracketed their maniflow lcb exhaust manifolds to the gearbox? The folded type that I took from the 998 wont fit between the pipes and the gearbox. it does not fit between them really more to one side. never bothered with them myself as they can cause damage to the diff case. I was just looking at fitting the clamp on mine the other day nick, care to elaborate on the damage they cause? Might not bother with it if there's chance it will do more harm than good. MokeSpider has seen the damage. I have not as i never fit them. but i would say the damage comes from poor fitment as the bolt is not longe enough when the braket is use and will work lose and then eat the threads. I would like to fit a bracket, having fallen foul of a metal gate stop in the middle of a track on a small crest that whacked my 998 exhaust. GEX7526 or better still GEX7088. Then join the bracket in the pic above, to either one. That is a piss-poor bracket. A 1/2 decent one nuts on to one of the big studs that hold the diff housing on to the gearbox. If I had one, I don't know how to attach it. I really would use one of the proper brackets with the one you've got. I would be nervous of clonking the exhaust like that. All the load would go through one bolt in aluminium. I have the GEX7526 bracket you suggested but there isn't the clearance between the downpipe and the casings to fit it as far as I can see. I agree that more mounting points would be preferable - something like the flat gearbox steady bracket perhaps? Strange. I'll have to grab a photo next time I'm grubbing about on the floor.